SquareTrade covers your device from all electrical and mechanical failures, including battery replacements if the original battery won't hold at least a 50% charge. Repairing your average mechanical or electrical failure can cost as much as buying a new device. We cover you beyond the manufacturer's warranty. How long is it covered? What else does a plan include? If your device breaks, file a claim and get it replaced in 2 days. We'll ship you a replacement device and provide a prepaid shipping label for you to send us your broken device. Customers receive a full refund if they cancel in the first 90 days. Refunds are pro-rated after that. Transferring your protection plan is free and can be done online or over the phone. Call 1-866-374-9939 from 6am to 10pm PST, 365 days a year. We'll ship you a replacement device (same or newer model depending on availability). 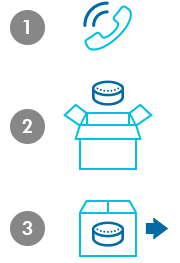 You'll also receive a pre-paid shipping label to send your damaged device back to us (must have a valid credit card on file in order to receive a replacement). Return your damaged device within 30 days from reception (otherwise you will be charged the price of the replacement). Upon purchase, you'll receive an e-mail within 24 hours. This will be your official purchase confirmation. Please read the terms and conditions (see the link at the bottom of the page). Start Date: Plan begins on the date your device is delivered, or on the plan purchase date if you already have your device and are purchasing a plan within 90 days of device purchase, and is inclusive of the manufacturer's warranty period. If you have an issue and are covered by the manufacturer at that time, you'll be directed to the manufacturer first. For assistance, call 1-866-374-9939, 6am to 10pm PST, 365 days a year. An agent is always happy to assist you. 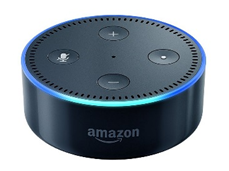 The Protection Plan + Accident Protection for Echo devices is only available on an Echo device that has been purchased within the last 30 days and is only available for customers who are residents of the United States. Give us a call at 1-866-374-9939.